F… awesome! I could get rid of the CountDown app totally! PS. Of cause it should be smart design and easy to use (less clicks as possible). Ex: flexible timer and some predefined timers (1,3,5,20 etc minuts). It will be very good if it’s possible to configure. The most critical to spent less time to start timer. Less clicks. Because it happens very often and every extra click is very annoying. The first “timer” should be empty… the same as for sub-activities to go up and select another activity to start. BTW, I’m always using predefined timers on iWatch, and don’t remember when I selected my own time interval. Such order will help to figure out what to do (by writing comments), and then do estimation. Will be very good! Is it possible to configure number of predefined timers and their value? I often use: 5, 10, 15, 30, I’m ok to have 5, 15, 30 as POC. Looks like it will be nice to have “Continue” dialog button if I want to continue. Ex: time is over. Dialog asks “do you need 5, 10, 15… or etc mins more” and buttons to restart the timer with the new value. PS. This feature is more critical rather then reports. It helps focus and control time over the day. I’m using iWatch for such time intervals with their timer. Yes, I do. Less pressing to prolong the activity for extra couple of minutes. 5, 15, 30 is the best options at least for me. Actually it’s ok. Pomodoro timer is very good. It shows a lot of information. In my case, I don’t use visual elements. I’m more interested in alarm. 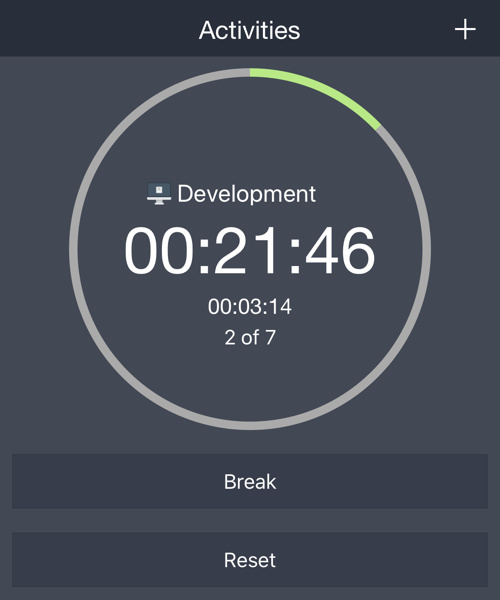 Timer for me is a reminder to take a pause and review. I don’t track how much time is remaining… But maybe somebody use it in their life. Almost one year from original post. Do you have any plans/roadmap for this feature? Could you add for beta-testing and this feature? Still waiting for the feature. PS. I’m using default count down timer from iWatch… it’s annoying to switch between iwatch timer and timetracker. And sometimes I missed countdown timer, or just forget about timetracker. It’s because they are not active on iWatch screen. Here goes a ping from me!